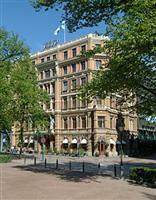 The Kamp Helsinki is a distinguished neoclassic hotel in Helsinki, just opposite the Esplanade Park. Helsinki Cathedral and Senate Square, the focal point of the city’s old town, are located just 100 meters from the property. Helsinki Vantaa Airport is approximately 25 minutes from the Kamp Helsinki Hotel and can be reached in 30 minutes. The Hotel Kämp Helsinki is comprised of 179 guestrooms, each of which is decorated in a traditional 19th century style and features dark wood furnishings, rich fabrics, and a warm color scheme. In-room amenities include high speed Internet access, direct dial telephones, satellite TV, and mini-bars. There are two main restaurants on the property, one of which is casual and the other is formal. Health conscious guests can spend their free time working out in the Hotel Kamp Helsinki Finland’s exercise room, or relaxing in the sauna. Weary guests looking to rejuvenate their tired bodies can pamper themselves with a range of spa services, which include massages, a Turkish bath, steam room, and aromatherapy showers.